Throwback Thursday: One of my most favorite pics ever. This was taken when I was doing cultural anthropological fieldwork in Central America. Specifically, here I did some work in Belize, in a Garifuna village called Seine Bight. 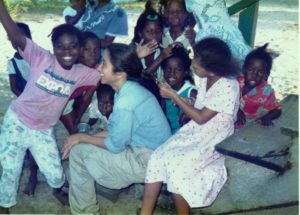 Each day when I’d arrive the girls would surround me with smiles and want to play with my hair. Playing with hair is such a cross cultural activity, full of giggles and chatter, at any age. Do you like to play with hair?